This is a very simple fundraising idea for any team, especially in an office or school. Our House uses the money raised to pay for the expenses associated with the care and stay of families whose children are hospitalized. The object of the game is for each team to raise more money than their competition. Different coin or dollar denominations collected will either add or subtract from a team’s total, depending upon how you assign point values. Teams can ‘sabotage’ each other by dropping in ‘negative’ coins or bills to reduce the enemy’s total. Competition heats up, and Ronald McDonald House is the winner! Teams. Divide your teams by grade levels, classrooms, departments, floors – whatever way works for you. Containers. Each team will need their own container to collect their change. Have each group clearly label and decorate their container. Goal. Set a goal of how much money you would like to raise from the event. Also, be sure to set and advertise the start and end date of your campaign. Points. One way to play the game is to have all coins count for positive point values and any dollar bills represent negative point values. For example, a penny is worth 1 point, a nickel is worth 5 and so on. However, a dollar bill would take away 100 points or a fiver subtracts 500 points. A variation on this is to have pennies count for positive points, and all silver coins and dollar bills count for negative points. There’s no right or wrong way to play, so set the points and scoring according to your preference. Create hype. 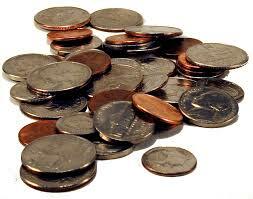 Post signs and send emails/ notices reminding your participants to save their pennies and spare change. Send notices to families about how this easy school fundraiser will work. Winners. The team that wins the penny war should receive some kind of a reward. Simple awards can be donuts, a pizza party, extra credit, longer lunch hour, a closer parking space, etc. Having a prize for the winning group will help add motivation throughout the competition. Matching Funds. Double your donation with a sponsor that offers to match your winnings! Please contact us with any questions. We thank you very much for supporting our families in need. Let the games begin!